Translation: Yuki Mine a living through fishing and pearl diving. Looking up the world tallest building in the heart of the ultra-modern downtown district, it is hard to grasp how so much could have changed in just half a century. Although much has been lost in the sands of time, Dubai’s history as a small fishing village dates back as far as 2,000 BC. Many relics from this long history have been recovered in the last several decades, and are now on display at Dubai Museum. 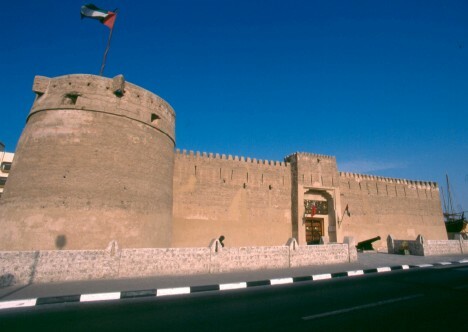 The building itself, known as Al Fahidi Fort, is 200 years old – making it the oldest in the city. 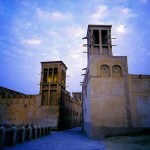 The fort, which is made out of coral rock, was used as ruler’s palace for a long time, and once even as a prison, before it was renovated in 1971 to be used as a museum. The display includes historical objects from diving materials, a traditional wooden boat (called dhow) to 5,000 year old artefacts excavated from Neolithic graves in the country. 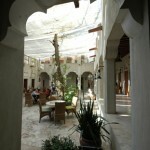 The area around the museum is the old Dubai merchant area called Bur Dubai. Despite the recent creation of the city’s commercial district, Bur Dubai is still popular with Indian traders, with shops selling textiles and electronics. 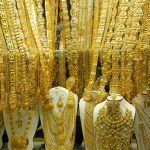 The knowledge that the narrow commercial streets were once filled with fish markets and jewellery shops selling local pearls, can lend a sense of nostalgia to any casual day visit.